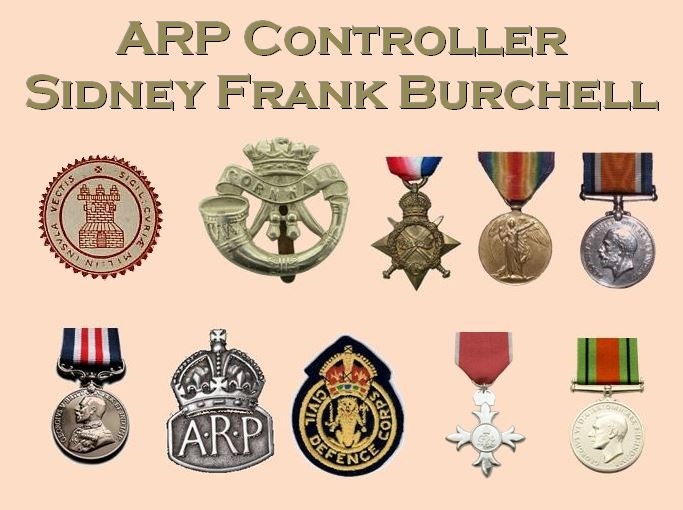 ARP Controller Sidney Frank Burchell passed away at the Royal County Hospital, Ryde, on 1 November 1963 aged 69. Sidney was born in Faversham, Kent, on 27 September 1894. His parents were Charles Simon and Fanny Charlotte (nee Rayfield). Faversham remained the family's location when the Census was taken in 1901. Ten years later aged 16 Sidney was one of dozens of members of staff of a large store that occupied a large section of High Street, Clapham. He was employed as a shop assistant in the drapery and clothing department and specialised in sports attire. 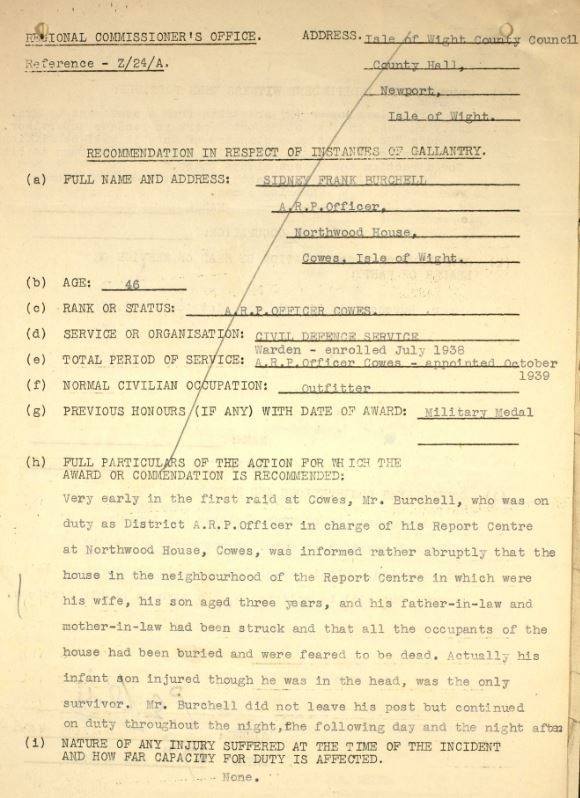 Life was to change significantly for him when the war began and in 1915 he attested to the Duke of Cornwall's Light Infantry, assigned to the 6th Battalion and later the 1st. 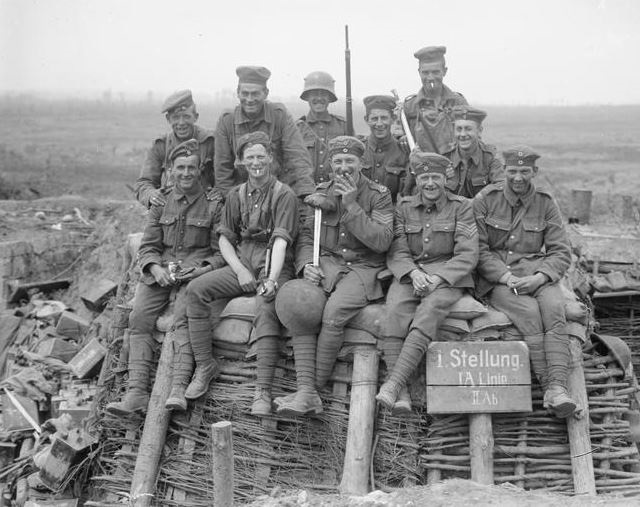 The 6th, a service battalion, were recruited at Bodmin in August 1914 under the command of the 43rd Brigade (Light Division) and landed at Boulogne on 22 May 1915. At some stage Sidney was transferred to the 1st Battalion, a regular unit, and made up to Lance-Corporal and later served as Acting Sergeant. 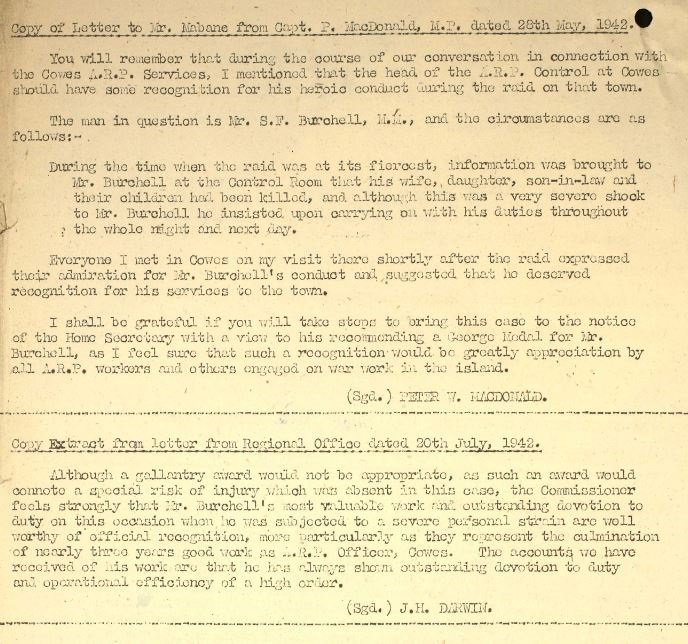 The 1st DCLI spent all but a handful of months of the war in the thick of the action. A section of the DCLI celebrating the capture of a German trench by donning their defeated foes headgear. It was during service with the 1st DCLI as Lance-Corporal that Sidney was awarded the Military Medal. 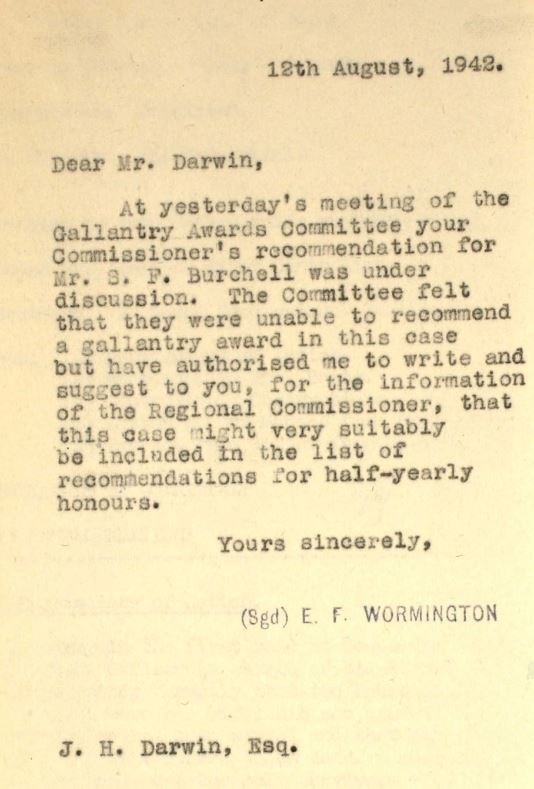 Whilst attempts to identify the specifics of Sidney's award have remained fruitless, the award of the MM to other ranks during the period in question was generally for acts of gallantry and devotion to duty under fire. At some point following the war Sidney relocated to the Isle of Wight and immediately became a prominent member of the Cowes branch of the British Legion, eventually rising to its chairmanship. His retail background enabled him to establish Burchell Bros. sports goods and outfitters of which he was proprietor for around 40 years. In 1938 he married Isabella Elizabeth Cole, 16 years his junior and the Island born daughter of company director George Henry Cole of Crathie, Baring Road, Cowes and his wife Elizabeth. Captain A.M. Fitzpatrick-Robinson was quick to raise a toast to the couple at the next gathering of the Cowes Legion, wishing them every happiness for the future. The couple settled at a house known as Comrie in Ward Avenue. 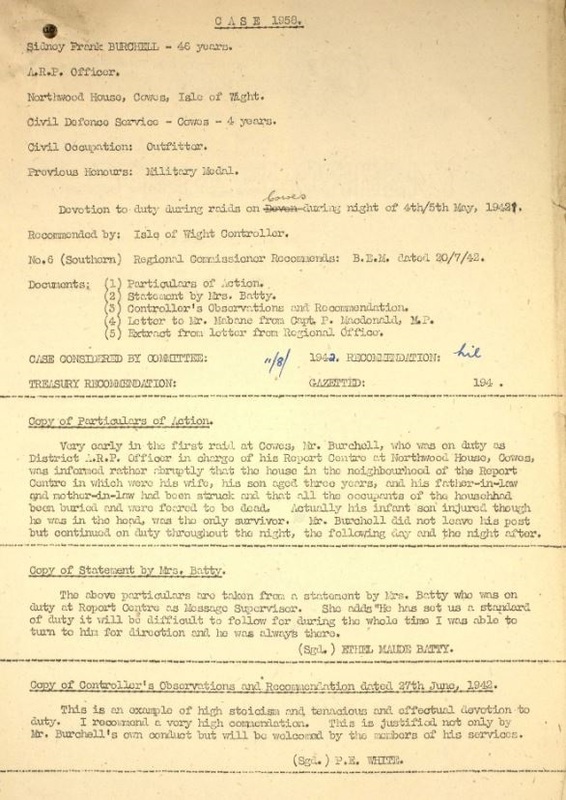 Throughout the previous two decades the local Press is littered with references to Sidney's tireless support of the Legion, his sporting activities and other extra-curriculur endeavours and it is therefore no surprise that he was one of the earliest to volunteer for a role in the Air Raid Precautions (ARP) in addition to heavily promoting support for the National Service and still earning a living as a sportswear retailer and distributor. 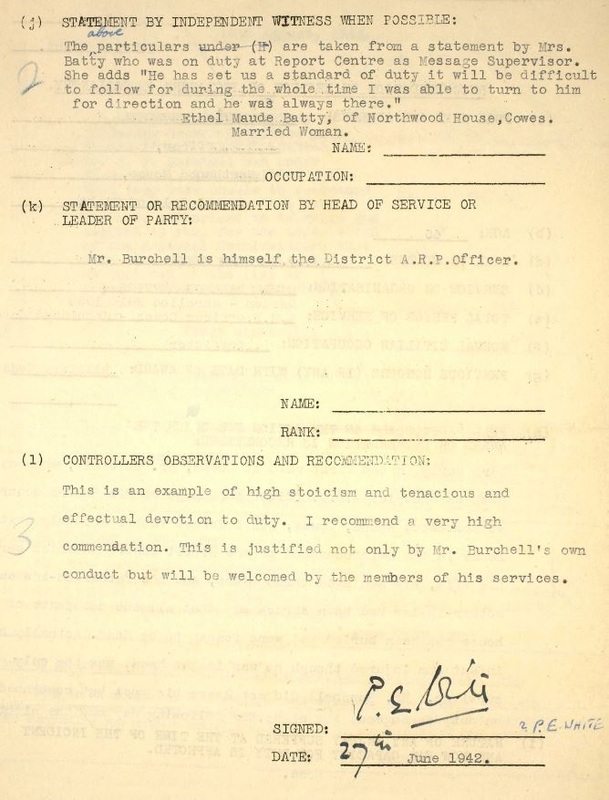 Within the ARP he originally served as a warden but his organisational skills were quickly recognised and he was elevated to the role of Senior Controller. 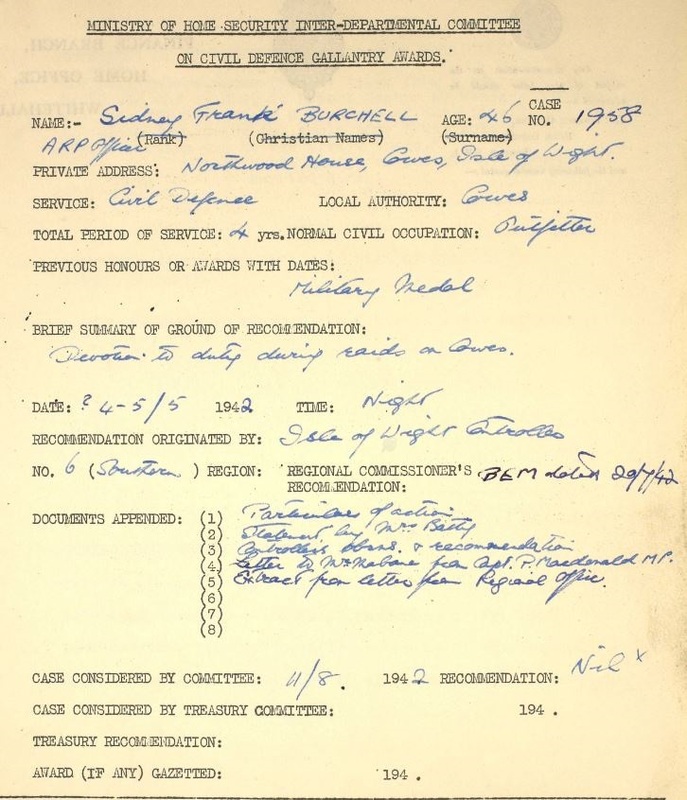 Many years ago when I was researching a particular subject connected to the infamous Cowes Blitz of 4/5 May 1942, I accessed a ledger that comprised the original handwritten log of the ARP Controller. Knowing nothing of Sidney or his story at that time it became apparent, when following the chronological entries, that the neat handwriting evident in the earlier part of the evening before the raid began, steadily worsened as the events of that fateful night played out before the writer. All through the night the Controller, who I now know to be Sidney, diligently recorded incoming messages and those he despatched out. I put the change in the neatness of the handwriting down to the tension of the event in its broader sense. Only recently have I discovered the story of how Sidney was directly affected while at his Northwood House post, but how this didn't prevent him from stoically continuing his duty in the knowledge of the most personal and terrible tragedy. 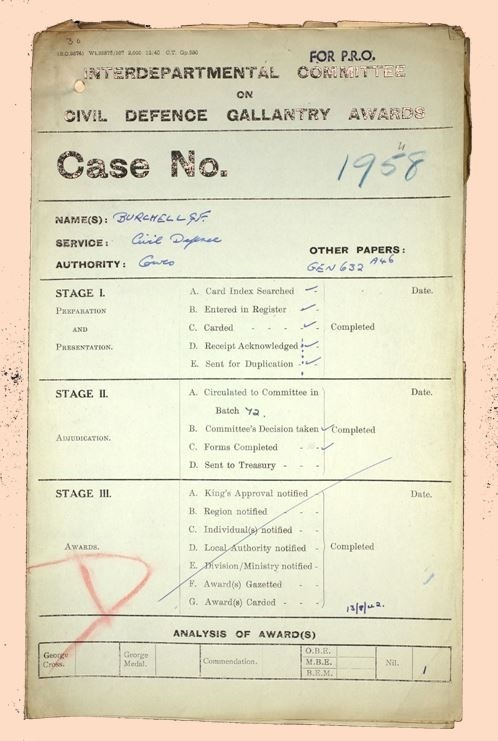 Rather than rewording what I discovered I have included the original documents below. 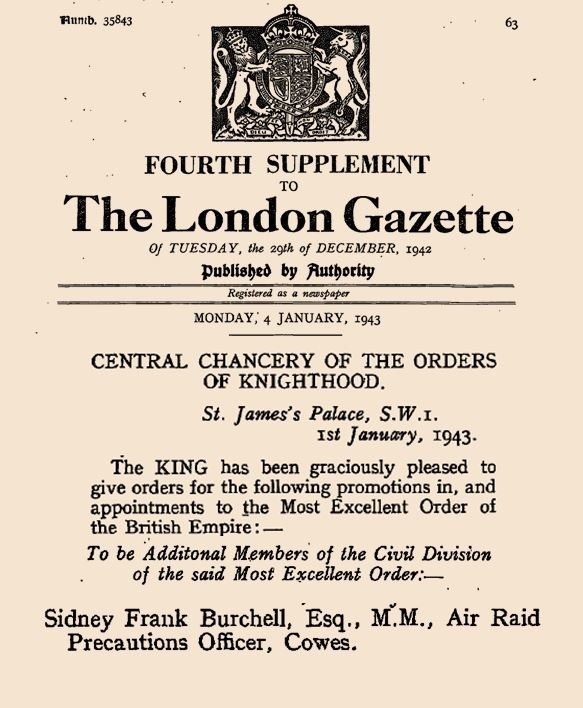 In the aftermath Sidney was made a Member of the British Empire. Sidney's tragic loss didn't prevent him from his tireless service both during the remainder of the war and for many years after. 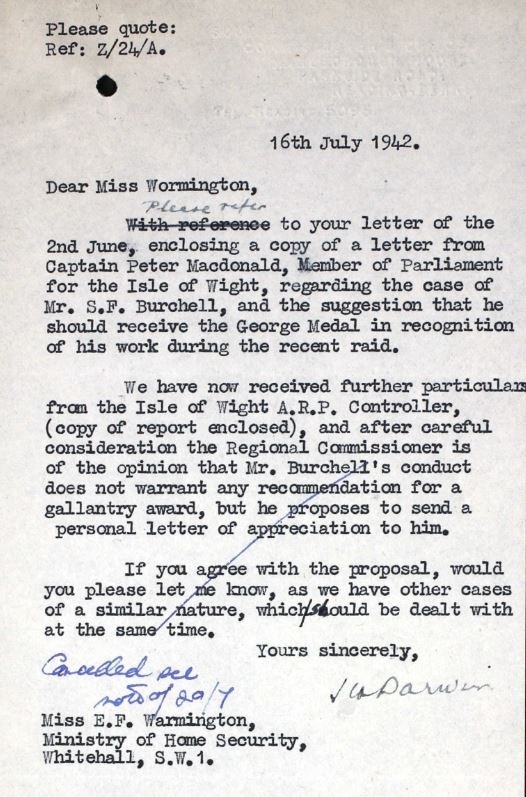 He was chairman of the IW Council from 1946-1959, and chairman of the Cowes Professional and Business Association. In 1948 he was remarried in Crodyon to one Dora M. Cook. His son David, who survived the injury sustained when his mother was cruelly taken, was enjoying his honeymoon in Majorca when advised of his father's death. Sidney Frank Burchell, M.B.E. M.M. was cremated on 5 November, his coffin flanked by standard bearers of the British Legion. 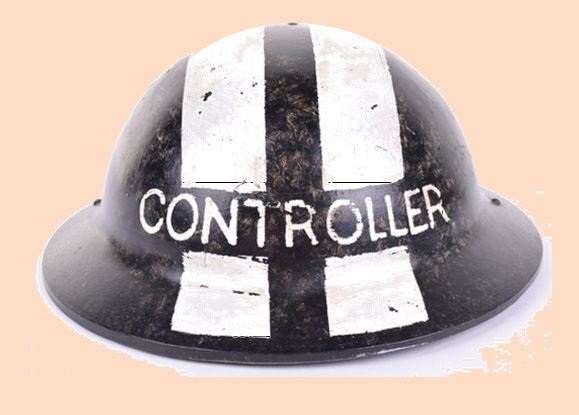 Rest in peace ARP Controller Burchell. 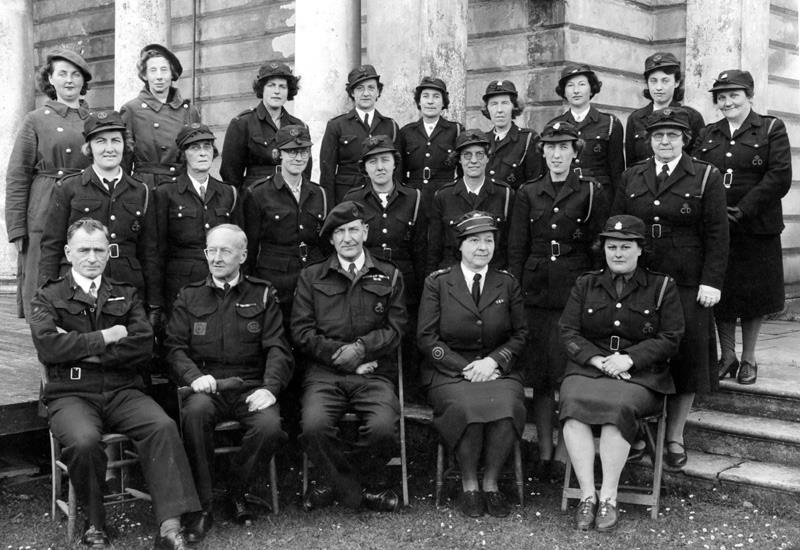 Cowes ARP at Northwood House, there's a high degree of confidence that Sidney Burchell is the gentleman at the front in the beret wearing a wide range of medals.